After going through the emotional roller coaster of Season 9, Angel and Faith find themselves separated by the Atlantic Ocean. Angel is trying to help clean up the mess in London that was caused by a magic bomb exploding, while Faith is bringing the newly-resurrected and now-teenaged Rupert Giles over to the US to the Scooby Gang with the help of Kennedy and her slayer-for-hire team. Season 10 picks up with these characters now in the hands of writer Victor Gischler and artist Will Conrad. 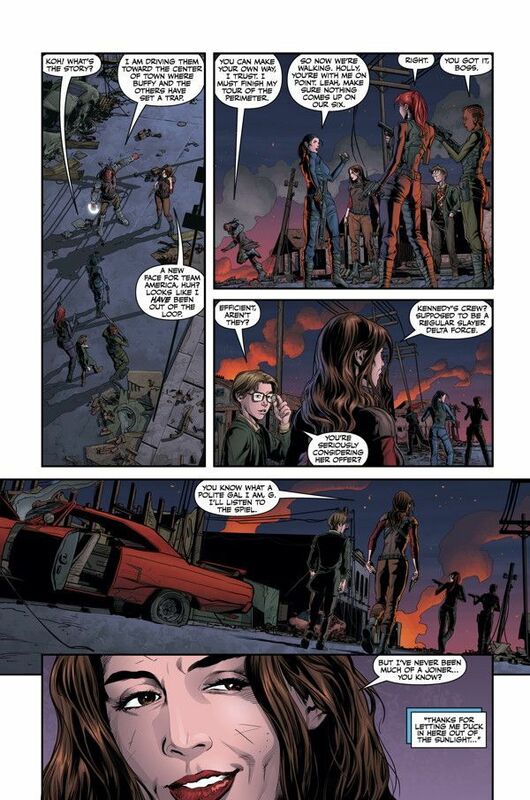 Last season's creative team of Christos Gage and Rebekah Isaacs have moved over to the main Buffy comic. 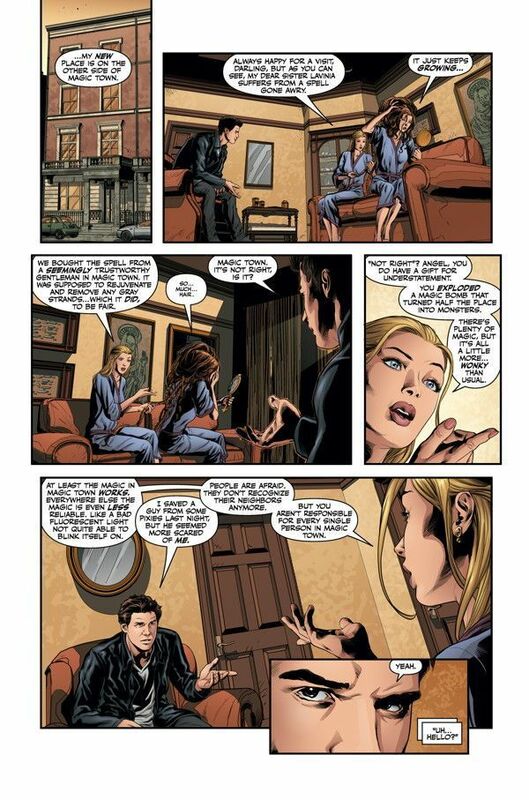 While Gischler and Conrad are setting out to do something different with their take on Angel & Faith, they have to first clean up the threads left from the previous tenants. The main storyline through Season 9 was the resurrection of Giles. 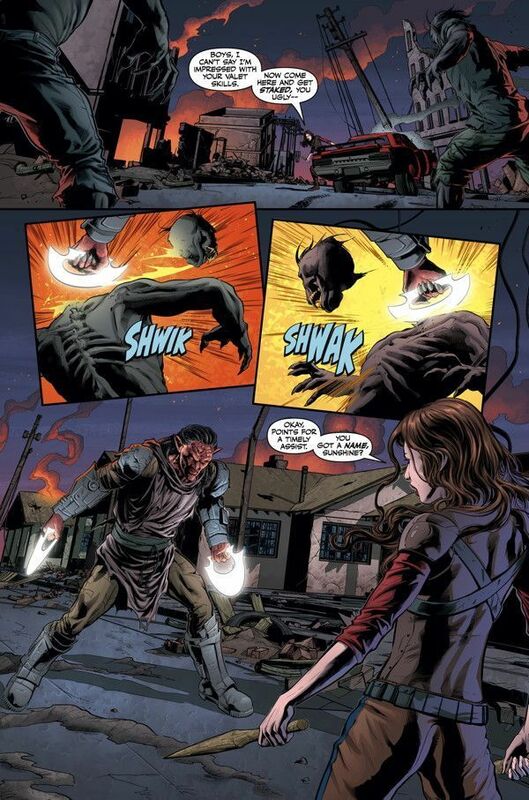 Although the team succeeded in this task, it's not quite finished, as the Watcher decided he would serve the cause better by Buffy's side. It's a bit of a slap in the face to Angel & Faith, who went through all the trouble to bring the guy back to life. Buffy didn't do a damn thing to help. Anyway, if you read the first issue of Buffy the Vampire Slayer a couple weeks ago, some of these pages will look very familiar. This time you see Faith's perspective of the reunion between the Chosen One and her Watcher. While it was tearful and heartwarming over there, it's rather sad and heartbreaking on this end. Faith had a very different relationship with Giles than what Buffy had. The two of them were united by the fact that they realized there were certain things that needed to be done and Buffy wasn't capable or couldn't bring herself to do them. Think Slayer Black Ops. Giles left his house and all his belongings to Faith when he died. Buffy got the slayer handbook. This is why I'm so shocked that the guy went running back to the blonde. 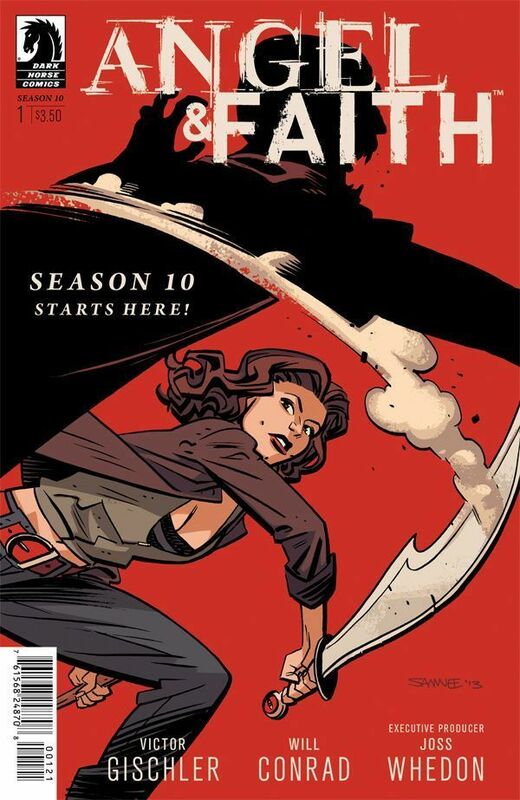 Faith shows this emotion for only a moment in the book, but you get a glimpse into her soul for that brief panel. On the other end of the world is Angel dealing with a deadly group of pixies. No joke. The big villain for the bulk of this comic is a tiny blue dude that would have hung out with Tinkerbell. He's got a group of other, tiny buddies and they're trying to rule over Magic Town – the area of London still reeling from the effects of the magic bomb that went off at the tail end of Season 9. While these creatures are not at all intimidating at first (OMG! One of them has a sharpened pencil! Look out! ), they prove to be rather deadly. I'm not yet convinced though. Of course, they can't be the “Big Bad” of this season, right? There's a reveal at the end of the issue that I will not spoil here. It wasn't who I was expecting but fortunately I was wrong, as the actual choice provides for much more character development. This turn allows Gischler to pick up a plot thread from Season 9 and expand upon it in a really interesting way. Will Conrad's artwork is very clean and detailed. His characters are lifelike and he nailed the likenesses of the actors from the TV show. What's fun is watching Angel's journey through the bowels of Magic Town. Conrad fills this with a variety of creatures including a centaur and a bunch of strange looking demons. It shows the wide breadth of inhabitants of this area of London where magic is at its strongest. What sticks out the most is the emotional beats. That moment I mentioned earlier about the joyous reunion between Buffy and Giles? It's beautiful. There are so many feels. This is immediately juxtaposed by Faith's shocked expression. It's like she was just punched in the gut. All of this is conveyed without a single piece of dialogue. Gischler let's Conrad tell this part of the story and the comic is better off because of it. Words would have ruined this scene. You get so much from each face in these panels. You feel simultaneously happy and betrayed by what's going on as you're seeing both sides of the coin. I'm excited to see where Angel & Faith goes under new management. I think it will take a few issues for Gischler and Conrad to sort through the remaining plot points from Season 9 before they can really nail down the path they want to take. The pixies took me a bit by surprise, but there's the same real emotion in these pages that previously fueled the book. These characters are deeply flawed, and unlike Buffy they don't have a support system in place in the form of several supportive friends. They're on their own and that's what makes them interesting.